Two Happy, Crazy Mormons: Transitions . . . The 2011-12 academic year is looking to be an excellent one. Lots of change--new jobs for both of us, new horizons, and new attitudes. It feels good, for once, to be optimistic about the future. I had my last day at the nursing home on August 23rd, and I surprised myself by actually being sad. I hadn't told any of the staff (except those in my department) or the residents that I was leaving, and had even considered not mentioning it at all, but finally decided that to just walk out on the residents would not be very nice of me. I did get a little misty as I said my goodbyes, but the past week-plus of not working there have cemented in my mind that quitting was absolutely the best decision I could have made. I feel better: more motivated, more like myself, lighter, freer . . . and healthier. Andy really likes his new internship, too, and it's been a good change for him to be working at a job relevant to his field. He likes all his classes and professors this semester (it was the first week of class this week), so things are definitely on the upswing for him, too. We will be busy, but we'll still have weekends, which seem such a luxury! Also, I finally joined the rest of the world and got a smartphone. I got an email from my Pops (the technophile that he is) saying Best Buy was giving away an iPhone 3GS to anyone who signed on a contract with AT&T, so I did. I gotta say, having an iPhone is awesome, even if it is the old school type. The phone I was using before was a hand-me-down that Dad cast off when he got his first iPhone (2008), and while I kept waiting for it to kick the bucket, it just wouldn't die. Unfortunately, I had to pass on the dinosaur to Andy, whose LG recently decided to stop taking a charge . . . if anyone has an old AT&T phone they want to donate, it'll probably be in better shape than the Samsung (ca. 2006). 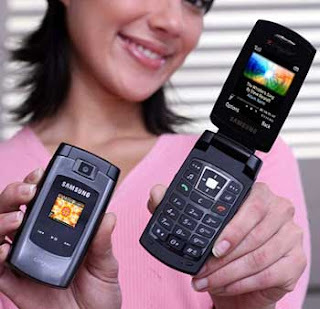 The old Samsung A707. Still kickin', but not too high. So, I guess that's about it for now. Hard to believe it's September, and even starting to feel like Fall (though not in the past couple of days--it's been pretty steamy). I'm ready for Fall, just not for what follows . . .